The original Broadway production of "Merrily We Roll Along" was a flop, due to the youth of its cast, its underwhelming physical production, and book problems. The failure was not due to Stephen Sondheim’s score (although I would suggest that the number "Bobby and Jackie and Jack" is inappropriate to suggest the promise of a composer, since the lyrics are what make the song). With revisions over the years, "Merrily We Roll Along" is finally in shape to work as a book musical whose scenes flow backward in time. Actor’s Express is presenting the show in concert, with only a bare minimum of staging by Freddie Ashley, consisting primarily of cast members moving from one music stand to another. Costumes don’t change; lighting doesn’t change; the set (consisting of assemblages of rectangles on the upstage wall) doesn’t change. The only change is in projections on the main rectangle that give the year in which action is about to occur. It’s basic staging, but it’s adequate for the needs of the concert production. There’s even a tiny bit of dance choreography, in the number "Bobby and Jackie and Jack." Sound design, by James Cash, uses seven upright microphones at the music stands to amplify the 14 voices of the cast and electronic hookups to broadcast music emanating from the two keyboards (played by music director Kevin Robison and by David G. Artadi-Beno) and the upright bass (played by Gabriel Monticello). There’s also drum playing by Dennis Durrett-Smith, and that comes through loud and clear. In fact, everything comes through loud and clear. When a musical number consists of a solo vocal line with contrasting ensemble interjections, it can be hard to pick out individual words. Not all singers are equidistant from their microphones, so loudness and softness can vary. All in all, though, sound levels are pretty good without being painfully loud. 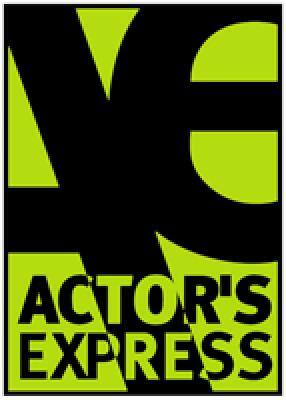 Actor’s Express has assembled a number of first-rate singer/actors to present the material. They all have strong voices, and all make a good stab at appropriate characterization. There’s not a shred of a New York City feel, though, although that’s where the action is ostensibly taking place. The ensemble (Andy Stanesic, Brandy Sexton, Mary Saville, Amy Reynolds, Trevor Perry, Chase Davidson, Taylor Bahin, and Curtis Lipsey III) all take on various small roles with verve, and the principals often act as chorus members too. Our lead, composer Franklin Shepard, is played by the powerfully voiced Craig Waldrip, ensonced in a suit throughout. His lyricist, Charley Kringas, is played by sweet-voiced Juan Carlos Unzueta. Jessica Miesel plays their long-time pal Mary Flynn, and her portrayal of the character’s arc is the most affecting of all. Joe Josephson, a big-time producer, is played by strong-voiced Skyler Brown. His Broadway star wife (and eventually Franklin’s wife) is played by Natasha Drena with a diva’s flair. Laura Floyd plays Franklin’s first wife with sweet appeal. The performances are all successful (especially Ms. Miesel’s), but the non-stop belting of the musical numbers gets a bit tiring.